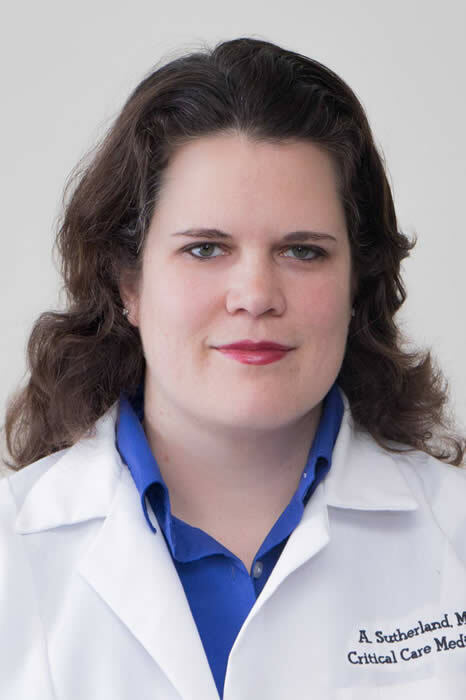 Dr. Anne K. Sutherland is the Medical Intensive Care Unit Director at University Hospital, and an Assistant Professor of Medicine at Rutgers – NJMS. Prior to joining the faculty at NJMS, she was the associate ICU director at St. Barnabas in the Bronx, NY. She completed both her Internal Medicine Residency and Pulmonary Critical Care Fellowship at Mount Sinai Hospital in New York City. She went to medical school at New York Medical College in Valhalla, NY. Dr. Sutherland’s professional and research interests include Patient Safety, the use of Analgesia and Sedation in the ICU, Critical Care Ultrasonography, and Palliative Care in the ICU. Dr. Sutherland serves as an Attending in the MICU, and also as a Pulmonary Consultant. She sees a wide variety of patients in her office, with many different lung diseases. She is a member of the American Thoracic Society, the American College of Chest Physicians and the Society of Critical Care Medicine.